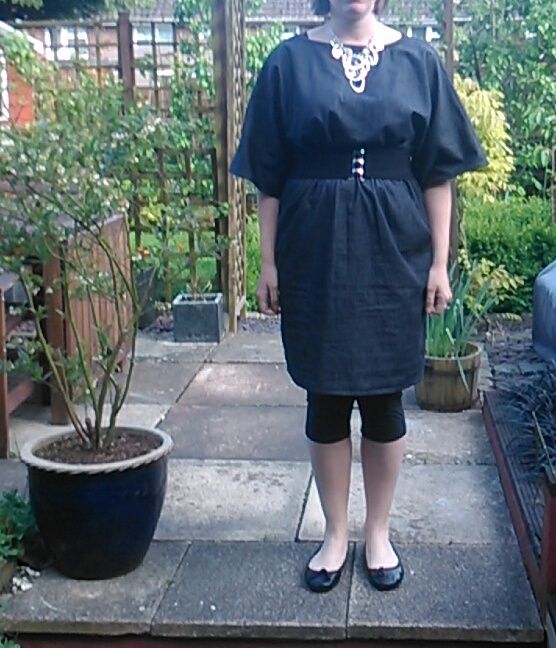 This dress is from New Look pattern 6120, a part of their project runway collection. I’ve had this pattern in my stash for quite some time, but dressmaking has been a pretty rare thing for me lately. When presented with the rare combination of the house to myself and a grand prix on the tv to watch, I decided it was time to get back into it. I wanted something pretty simple to ease myself back into it and something I could get finished in one go as sewing time is so rare these days. This pattern seemed the perfect choice. As you can see from the pattern picture, it’s a design particularly suited to slinky fabrics but they are a pain to sew with and I don’t really have much of an excuse to wear slinky dresses any more, so I chose a black chambray from Truro fabrics which arrived in super speedy time! According to the pattern back, my measurements would make me a size 14 but I know from experience that would result in something huge, so I followed my practice of choosing a size using my upper bust measurement as my bust measurement and traced and cut the 12. 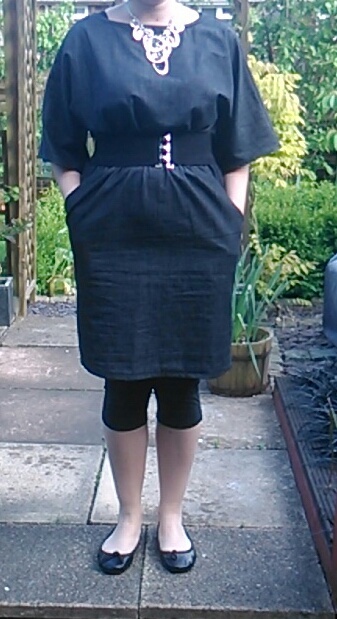 I think the fit is ok, maybe a bit too loose in the neck but it is a dress designed with a good amount of ease. I actually prefer how the dress feels/looks on in real life to how it looks in these pictures, the two don’t seem the same to me at all which is really weird. I really enjoyed making this dress, it was simple to put together even with these brilliant pockets in a style I’ve not made before! The instructions were really clear and easy to follow and I really liked the workroom hints littered throughout. I like the length, although I could go shorter if I’m going to wear it with leggings. The only thing I don’t really like about it is the neckline, the bias strip is sewn to the outside and mine ended up a bit wonky, hence the big chunky necklace. If I make this dress again and I think I will, in something a bit more vibrant then I think I’d do a bias tape facing to the inside for the neck. I think I would also do french seams instead of the stitched and pinked I’ve done here. All in all though I’m really pleased with this make, I think it’s the best thing I’ve sewn in ages and it was a great project to get back into dressmaking with. Oh, also I had every intention of making the belt, but I forgot to add it’s requirements when I ordered the fabric and I didn’t have enough, I think it would look better with the tied obi style belt instead of an elastic waist belt, but oh well, I can always make one another day!